English sources describe the Vikings as very attractive: Viking men were clean and fragrant because they always took a Saturday bath, combed their hair and wore beautiful clothes. In addition, it must be added that they were tall, blond and well-trained – which certainly also made ​​a strong impression on the ladies. ” (The Danes) …caused much trouble to the natives of the land; for they were wont, after the fashion of their country, to comb their hair every day, to bathe every Saturday, to change their garments often, and set off their persons by many frivolous devices. In this matter they laid siege to the virtue of the married woman, and persuaded the daughters even of the noble to be their concubines”. “Lørdag” means Saturday in all three Scandinavian languages ​​and derives from the Old Norse word “laugardagur”, which means “washing day”. It is an old myth that the Vikings were unkempt and not concerned about their appearance. A number of archaeological findings of “beauty products” in Scandinavia and the UK, – such as combs, tweezers, jewelry and beautifully decorated and colorful clothes, show that both women and men were vain. Wonderful wooden carvings from the Viking ship graves, beautifully decorated weapons and jewelry testify highly developed art forms and aesthetic sense. Why would not this also apply to how the Vikings looked? In 2009, there was made ​​an interesting finding at Bjørkum by the Lærdalselven river – a trading place connecting Western and Eastern Norway. Among other objects, there were found three beautifully decorated combs, and one had a runic inscription: “Øystein (or “Man from the east”) made ​​this (comb)”. Combs had high status in the Viking Age and the inscription suggests that this item, which most likely is from the 800s, is made by a craftsman and specialist. The hair and beards fashion changed much during the Viking Age which lasted for about 300 years (c. 793-1066 AD), but was always important to the Norsemen. This is proven by royal nicknames like Sweyn Forkbeard (Old Norse: Sveinn Tjúguskegg) who had a beard that was split in two and Harald Fairhair (Old Norse: Harald Hårfagre) who must have had a very beautiful hair. 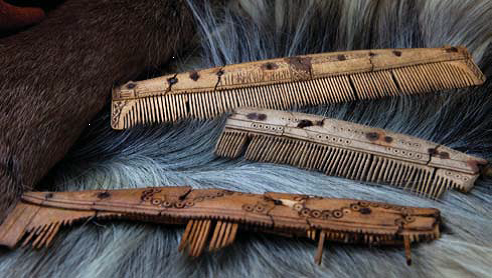 The many findings of combs also show that it was common for the Vikings to comb their hair. In an anonymous English letter a man insists that his brother must follow the Anglo-Saxon tradition and not the “Danish fashion”, described with long hair on the forehead and short in the back of the head. The beards were also important. 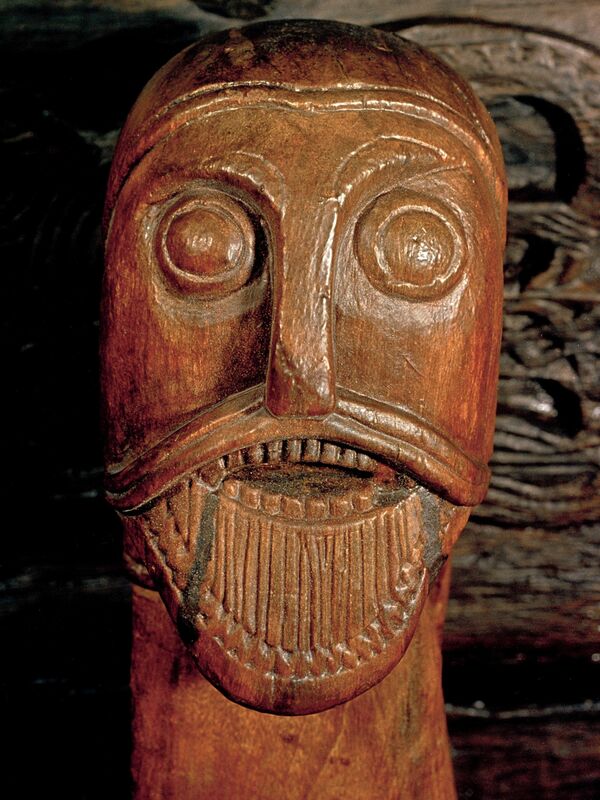 This is seen clearly on a carved male’s head from a carriage in the Oseberg ship grave. Here we see a Viking with long, well-groomed mustache and beard. Women also had well-kept hair. It was often long and blond, and could be gathered up into a knot with beautifully decorated hair clips and combs. There is a huge error at the beginning of that post about what is a pivotal point in British history. The Danes were massacred on St. Brice’s Day (November 13), not the other way around. The best documented incident was in Oxford where local Danes took refuge in St. Fridewide’s church which was burned to the ground with them inside. That’s documented in Ethelred’s charter explaining the need to replace the church which had been burned. Of course, and thank you! Writing mistake: – “by” is corrected to “of”.